Bracelet made of a rolled sheet of pale-coloured patterned anodised aluminium. Anodised aluminium sheet, blockprinted and dyed, then milled to stretch and craze it. Fabricated. 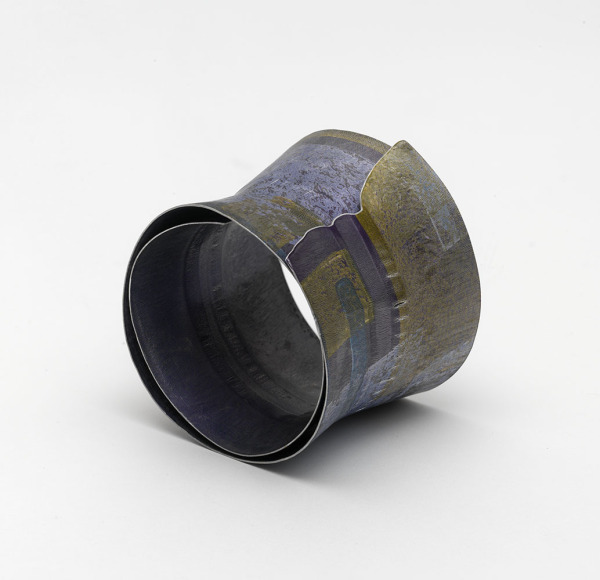 Fluted Violet Bangle, Jane Adam, 1999, Crafts Council Collection: J273. Photo: Todd-White Art Photography. These pieces [including bangle and earrings] are a development of an ongoing dialogue with the possibilities of anodised aluminium to create jewellery which is sensuous and precious. They fall somewhere between my production work and the one-off pieces; they exist as parts of series of similar pieces, where the exact form and size will depend on the qualities of mark and colour (rather than the other way round), and on their alteration by stretching to create the surface texture.